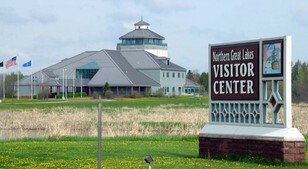 Join us for another Passport in Time Project at the Northern Great Lakes Visitor Center in Ashland! This year, our mission will be to continue recording the history of well-established, century-plus-old resorts in northern Wisconsin. This is the second oral history project focused on these resorts. Our undertakings in 2013 produced some very interesting results. For instance, the widow of the former owner of The Little Bohemia provided a sworn affidavit of her husband's accounts of the John Dillinger/Baby Face Nelson shootout with the FBI. Later in the project we also interviewed a surviving family member whose parents owned the Voss' Birchwood Lodge where the FBI was holed up to stakeout Dillinger! As you can see, we go some real stories! Needless to say, we are hoping this year's round of interviews will yield as much or more! We hope you'll join us this summer for another foray into Wisconsin's historic past!